Can save "NATO.Marksman(MTP)MAR-10" with XLA as ""NATO.Marksman(MTP)MAR-10 temp", but resulting profile cannot be loaded in BIS Arsenal; LOAD button greyed out. The last profile to not be loadable in BIS Arsenal is NATO.Medic(MTP)MX. However, loading in XLA then saving as "NATO.Medic(MTP)MX temp" allows the aforementioned temp profile to be loaded in BIS Arsenal. Began to suspect a fixed 'black hole' range where anything that slips into it cannot be loaded. So, created "NATO.Marksman(MTP)HK417 Night unreadable 1". 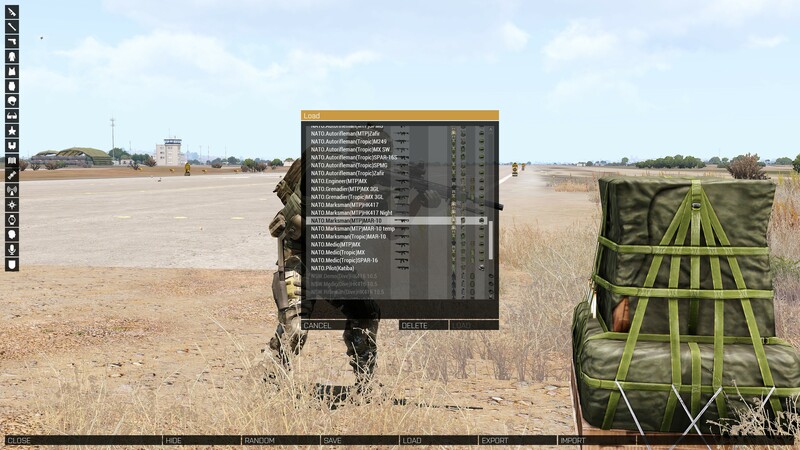 Success - the previously non-working "NATO.Medic(MTP)MX" slips down the list; can now be loaded. Created "NATO.Marksman(MTP)HK417 Night unreadable 2", "NATO.Marksman(MTP)HK417 Night unreadable 3", and "NATO.Marksman(MTP)HK417 Night unreadable 4" to push "NATO.Marksman(MTP)MAR-10" into loadable range. Problem confirmed to be a fixed range where anything which slips into it is un-loadable. Will be a problem again when alphabetically inferior profiles saved above will push loadable profiles down into unloadable "black hole." Uncertain what initially caused this, thus unable to reproduce. 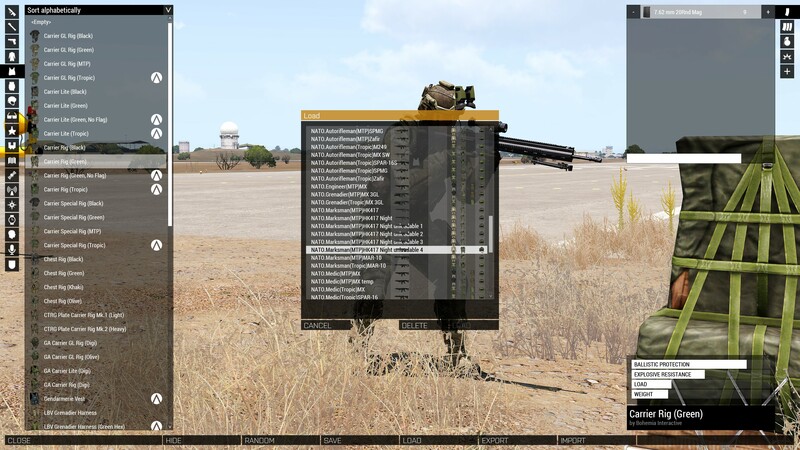 $username$.vars.Arma3Profile attached for reference. May be a duplicate of mine, but it's far better documented. I can also confirm most of this. When I finally deleted all my loadouts to transition to the ACE3 arsenal, I noticed the exact same "black hole range" behavior. As the loadouts shifted up the list they became available/unavailable depending on how many entries down the list they were. There also seems to be multiple ranges, as you can see in the video attached to my ticket.